Spray 13x9-inch (3-quart) glass baking dish with cooking spray. Cook and drain noodles as directed on package. Place in cold water. Meanwhile, in 12-inch skillet, cook beef and garlic over medium-high heat 5 to 7 minutes, stirring frequently, until beef is thoroughly cooked; drain. Stir in pasta sauce, ground red pepper and 1 teaspoon of the basil. Heat to boiling, stirring occasionally. Remove from heat. Heat oven to 350°F. In medium bowl, beat egg slightly. Stir in ricotta cheese and remaining 1/2 teaspoon basil until blended. Drain noodles. Spread about 1/2 cup sauce mixture over bottom of baking dish. Top with 3 noodles, 1 1/2 cups of the sauce mixture, half of the ricotta mixture and 3/4 cup of the mozzarella cheese. Repeat layers once. Top with remaining noodles, sauce and mozzarella cheese; sprinkle with Parmesan cheese. Spray 15-inch piece of foil with cooking spray. 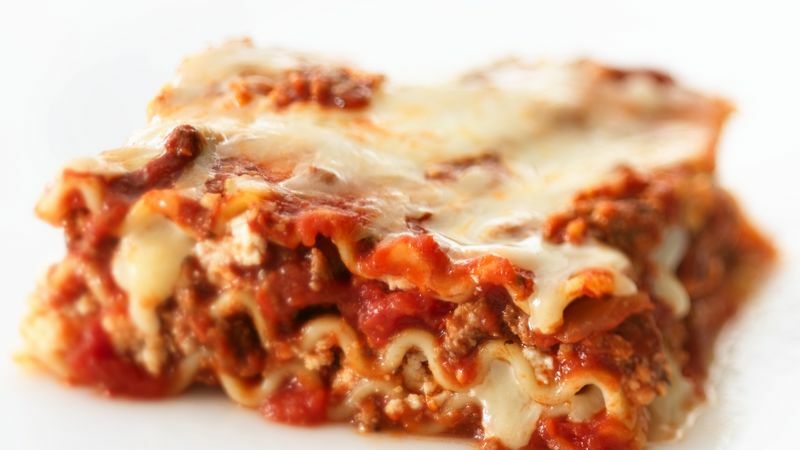 Cover lasagna with foil. Bake 45 minutes. Uncover; bake 10 to 15 minutes longer or until bubbly. Let stand 10 minutes before serving. To reduce the fat, we used extra-lean ground beef, light cheeses and only 1 egg instead of the 2. Basil and a touch of ground red pepper enhance the flavor.